Create your own Magazine Website with Premium Joomla 3.0 Magazine Template Leviathan. Leviathan is visually enriched design with stunning graphics, contrasts and tones. Its sidebar adds focus and boldness, that complements and contrasts with the mainbody area to great effect. The core of the template is based on the Gantry Framework, which provides a plethora of standardized features and functions. Also included is support for Extensions such as RokSprocket. Click here to see more features of Joomla 3.0 Template – Leviathan. 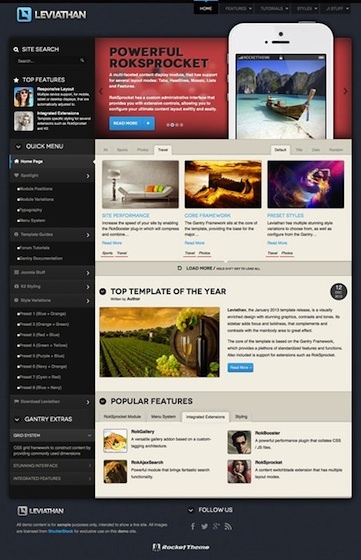 RocketTheme is a Premium Wordpress and Joomla Template provider. RocketTheme has Joomla Templates to create Business Websites, eCommerce Websites, Newspaper Websites, Magazine Websites and more. Join RocketTheme membership and have unlimited access to all themes.